Desiccation was the word that best described the garden at the end of June, but as July ends there are some signs of verdancy. July was a difficult month for the already stressed perennials and shrubs, but some decent rains have had a visible restorative effect on many of them. Even the lawn now shows less brown and more green. While the garden seems willing at this point to make the effort to improve, this gardener is finding excuses. The garden could really use some serious maintenance but as usual, it is getting very little attention as the summer goes along. Among the many tasks that need tackling are applying mulch garden-wide and dividing the irises. I have done some weeding, deadheading and trimming, but not nearly enough to improve the overall effect—there is so much more left to be done. Another week though before I can get some time to concentrate on it. 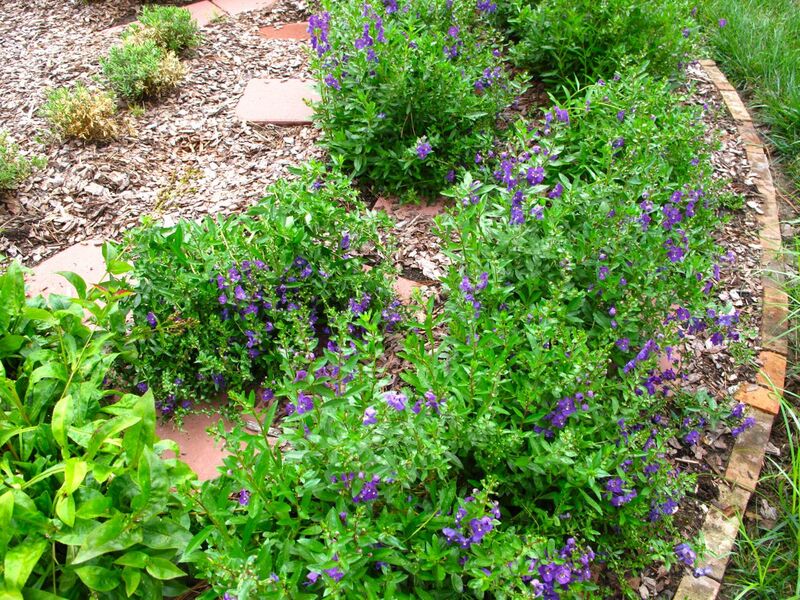 In the meditation garden Angelonia angustifolia ‘Angelface Blue’ (Summer Snapdragon) lies sprawling across the labyrinth’s path, knocked over by recent poundings of rain. Last summer was the first time I had planted Angelonia, an annual, and it was outstanding well into October. This year it has not been quite as spectacular, but it is finally beginning to bloom more profusely. The bees really enjoy the flowers. The meditation circle is normally a very low-maintenance feature, but a heavy rain this past weekend also washed away much of the pine bark mulch, covering many of the stepping stones. The section of Thymus x citriodorus (Silver Edge Thyme) is mostly green, but in some poorly draining areas it is starting to show some brown spots from excess standing water during the storm. Perhaps the thyme will bloom yet. 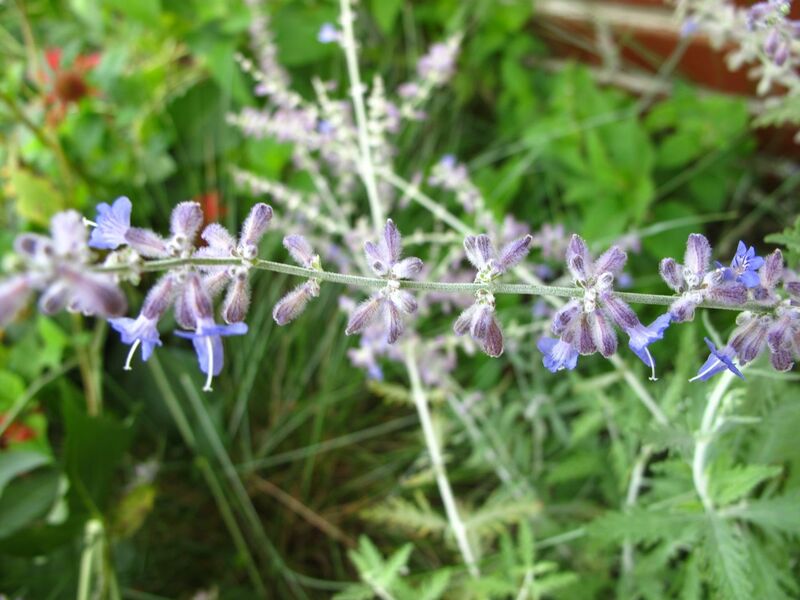 There are a few faint colored puffs on it that, when one looks close, are seen to be little lavender flowers. 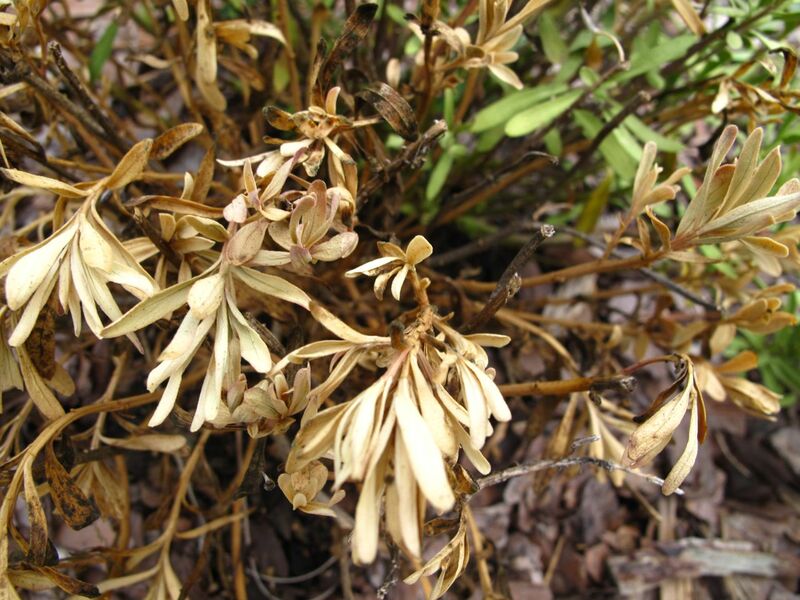 Once the star performer of the labyrinth, Iberis sempervirens ‘Purity’ (Candytuft) is losing its shine. Many of the mounds are severely stressed. This time last year it was holding up beautifully and was quite green. The candytuft bloomed from December to May this year and perhaps needs a rest. Maybe some compost should be added for nutrition. ‘Husker Red’ is still working well in the meditation circle. Curiously the leaves of the ones planted last year are mostly green, with little or none of this luscious dark red colored-foliage found in these that were added this year. 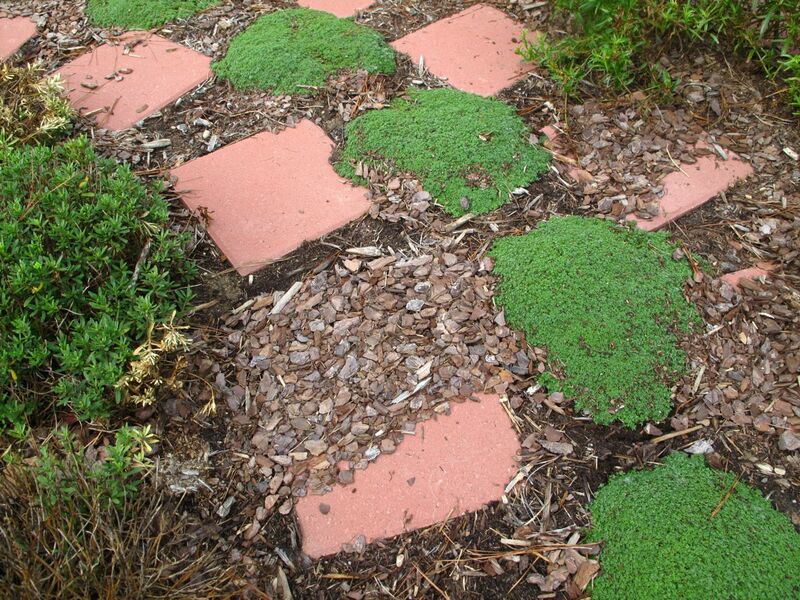 The coral Dianthus lining the entrance makes a nice pairing. Perovskia atriplicifolia (Russian Sage) has flopped over but is blooming now and should last well into autumn. Encouraged by recent rains, Clematis ‘Jackmanii’ now has a few new blossoms. Rudbeckia hirta ‘Irish Eyes’ is in full bloom to the delight of many insects. The stalks of this Rudbeckia seem very sturdy but, like those of so many items in this garden, they would benefit from staking. 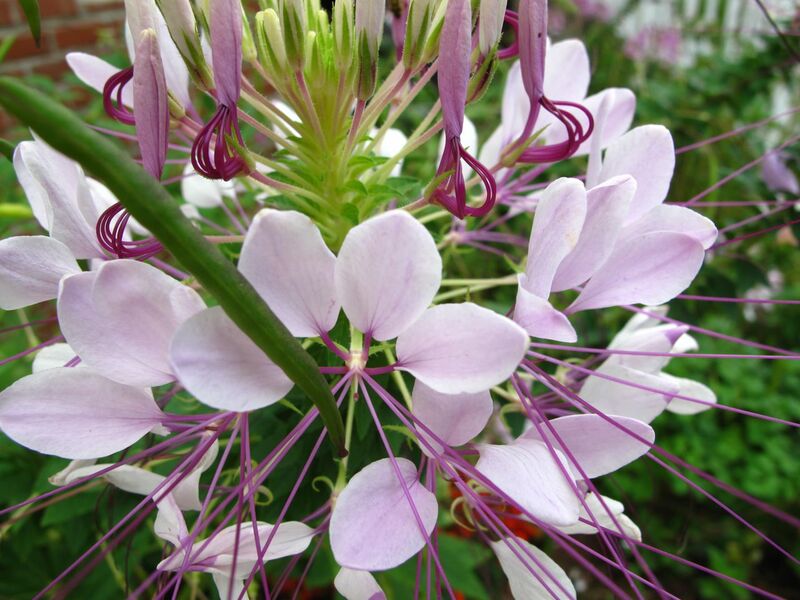 Cleome has flowered well in one spot and poorly in another. In early July there was a heartbreaking loss of a Crape Myrtle in the front yard from a freak wind storm. The same storm brought down a pine into the garden, obliterating a Buddleia davidii and some other plants in an area along the back fence, an area I have been actively trying to invigorate. Actually there are several large gaps along the back fence. 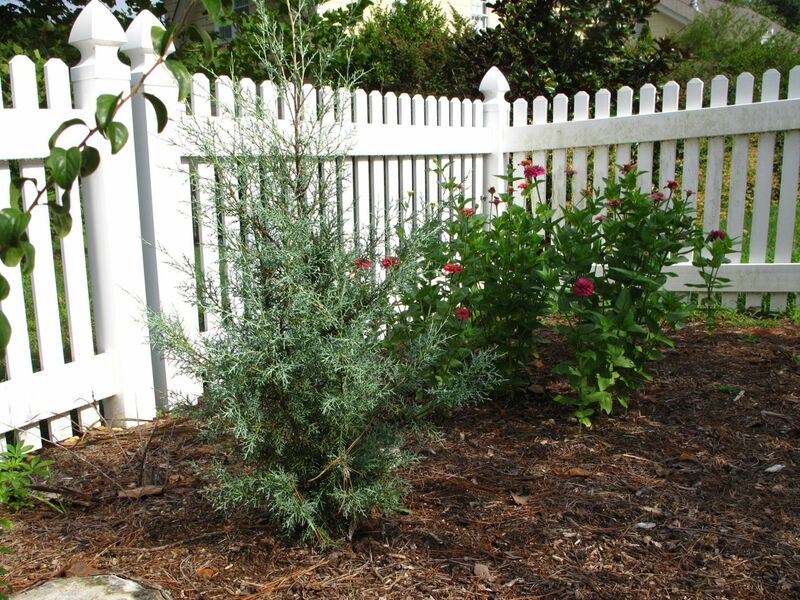 In the northwestern corner a ‘Carolina Sapphire’ Arizona Cypress was planted earlier this year to replace the eleven-year old one we lost last summer. This is a fast-growing tree that will fill this area in a few years. Meanwhile I can tell it has grown quite a bit. While waiting for the ‘Carolina Sapphire’ to mature I envision this corner overflowing with cutting flowers in the summer, but my efforts have been small. 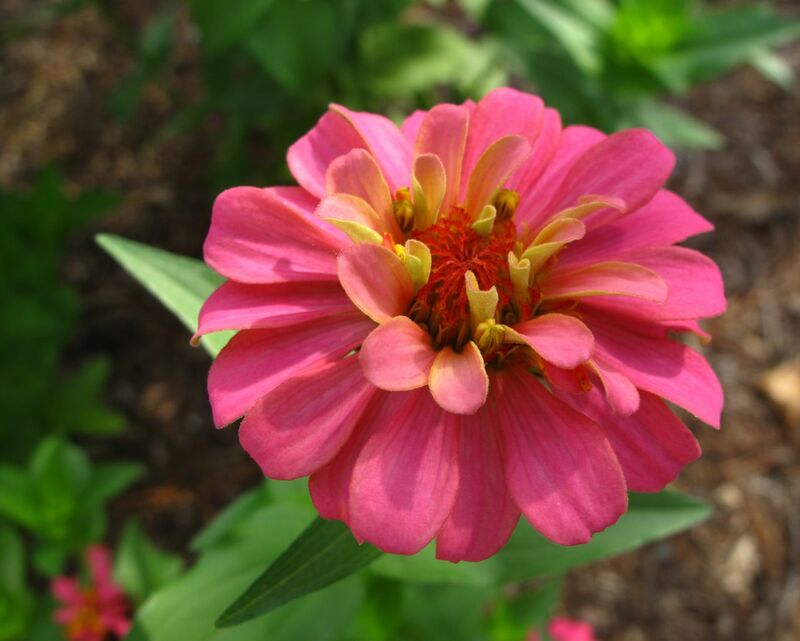 Zinnias were planted from seeds, but thwarted by extreme temperatures, they remain small and insignificant. I think the birds must have eaten most of the seeds. This is a rather poor showing. Transplants of cleome did not survive here. Also Gladioli planted in this same area flopped over after their first exposure to wind, so they did nothing to make the garden look nice long-term, but their blooms provided enjoyment in cut-flower arrangements. So, there are many openings and opportunities around the garden at this time. Although I am not doing much work in the garden this summer, I am thinking and planning. I am optimistic the garden will be fun again next Spring. And, while there are no grand views, no wide vistas in the garden right now, it is surprising to me how many individual plants are providing some interest. It seems much better than in years past. Meanwhile birds, wasps, bees and other insects do not seem to mind the garden’s disarray, as they feast on nectar and seeds. The yellow of American Goldfinches brightens the garden as these tiny birds feed on various plants—they especially seem to appreciate the Echinacea purpurea (Purple Coneflower). 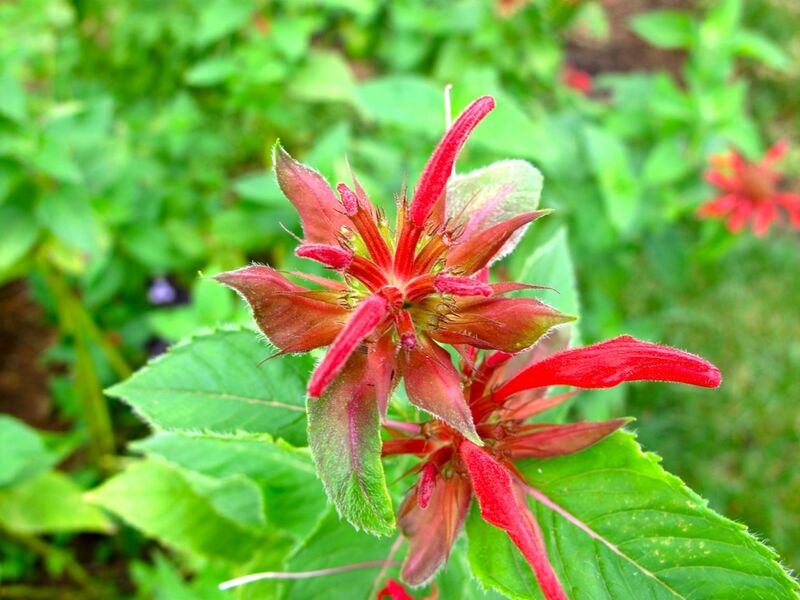 Hummingbirds regularly visit Monarda didyma (Scarlet Beebalm), which is no longer lush and spectacular but is still in bloom. 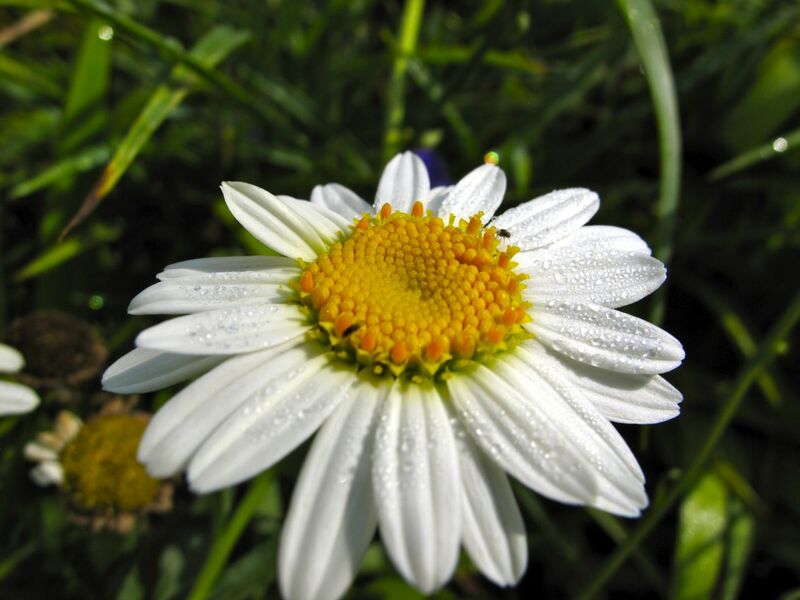 And fresh dew on Shasta Daisies is still a remarkable thing. With two days to go this hot July stopped short of setting a local record for the number of consecutive days above 90 degrees, when the temperature reached a mere 89 degrees yesterday. Precipitation was 0.5 inches above normal for the month (actual month total was 4.64; normal month total, 4.04). Three heavy storms on the 21st, 22nd and 28th accounted for 3.31 inches of that. 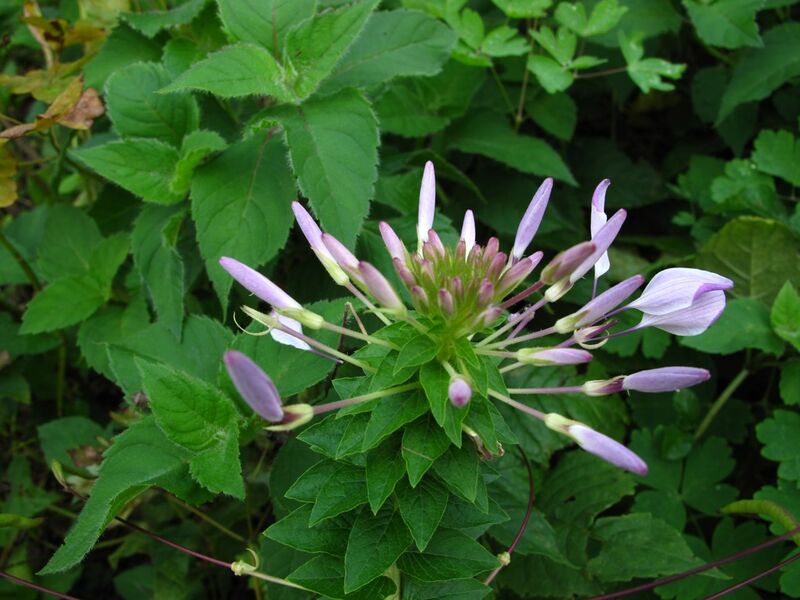 This entry was posted in garden and tagged almanac, angelonia, candytuft, clematis jackmanii, cleome, iberis sempervirens, meditation circle, meditation garden, meditation path, nature photography, penstemon, photographing nature, summer garden, thyme on July 31, 2012 by pbmgarden. As a neighbor, I so appreciate all your efforts. 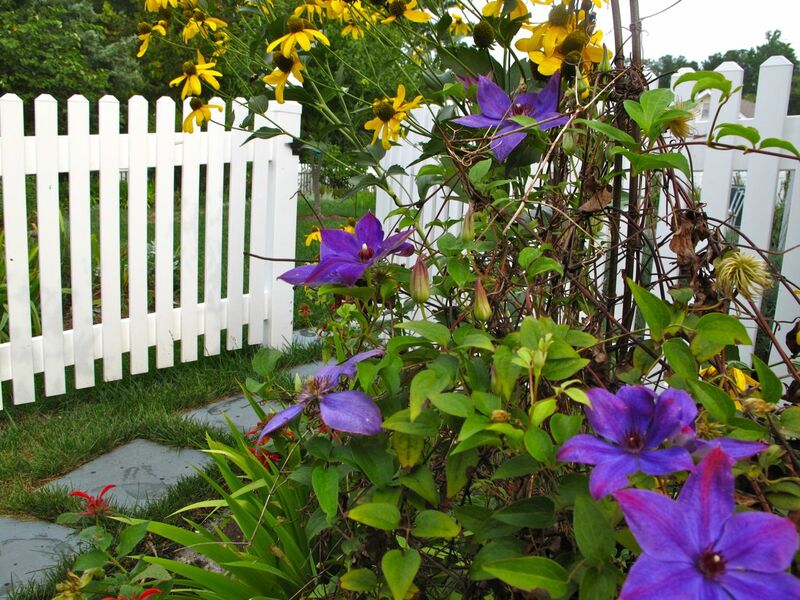 The beauty of your garden is outstanding, plus you are keeping us aware of our weather imbalances, including a discription of the heat by degree and the rain by inches. Thank you. 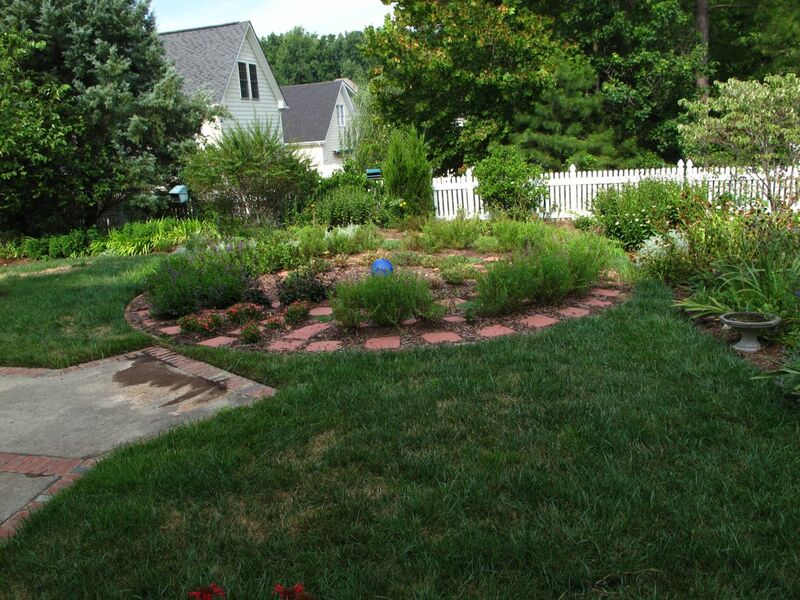 Glad you enjoyed my little almanac today, Linda, and I really appreciate your generous words about my garden. Thanks so much! 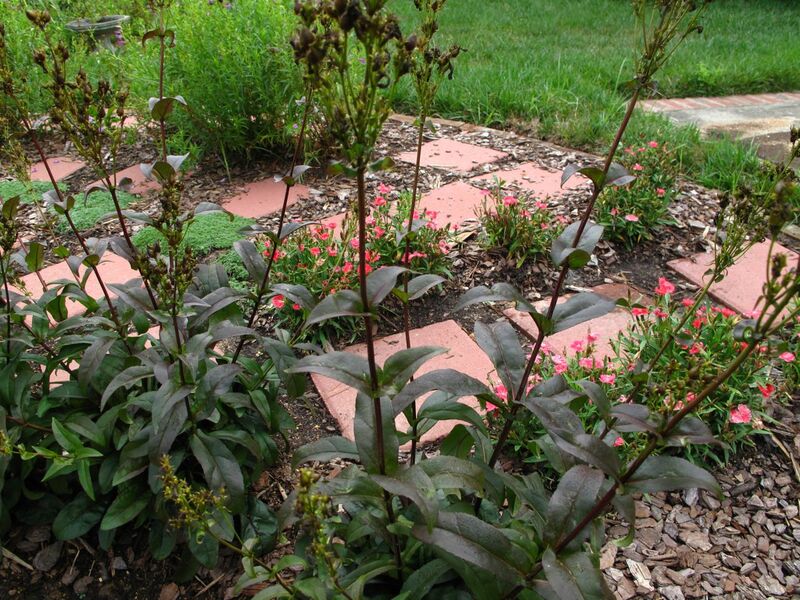 Too bad about your Monarda–the weather has made it tough this year to predict what will be in bloom at any given time. I really appreciate your viewpoint, Cathy, and I may just be an armchair gardener until September! Too much rain, too much sun, plants have to hardy to survive what nature throws at them and they all manage surprisingly well with just a few casualties. Your flowers are looking lovely, I do like your Angelonia, that is a new one for me, must see if I can find it over here.Your flowers are certainly well ahead of ours, my Perovskia won’t be flowering for at least another month, its grown rather tall with all the rain we have been having.Love the combination of your Clematis Jackmanii with rudbeckia, that really sings! Thanks for your comment Pauline. 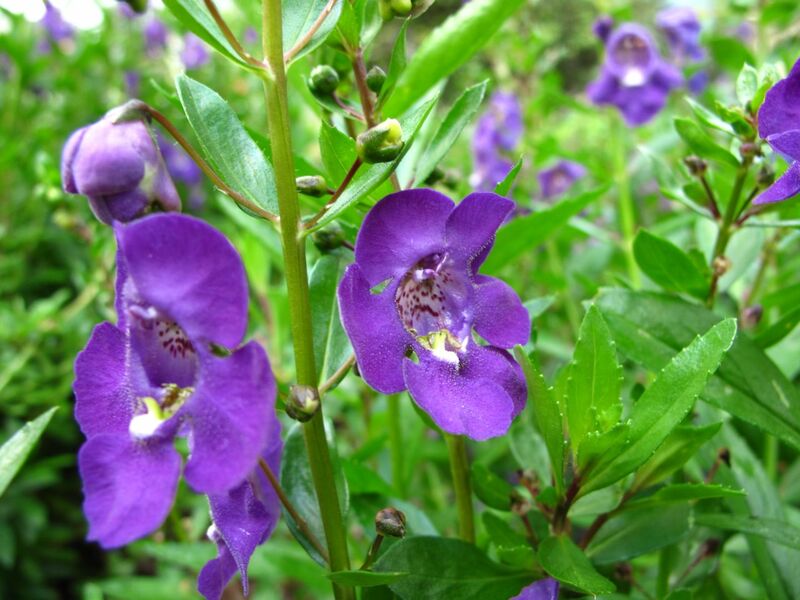 I love the Angelonia for its ability to thrive in our hot, humid summer. It seems to do equally well through dry or wet periods and it attracts many pollinators. Last year this Perovskia was much later in opening, but perhaps extra rain helped it. I’m still looking for a good location for it. Hope yours will do well. Your garden still looking great. I think you know by now that gardening is the task you will never get done. Never. Thanks for the encouraging words! You’re right about gardening being never-ending. Is that what keeps us going?